Here is a real rarity, but a completely spellbinding musical event: a Richard Rodgers and Oscar Hammerstein musical getting its British professional stage premiere nearly 70 years after it was first seen on Broadway. While their first two shows Oklahoma! and Carousel which preceded it, and South Pacific which came immediately after, have long been part of the standard musical theatre repertoire, Allegro has been largely lost, except for a couple of stand-out songs (The Gentlemen Is a Dope and Come Home) that have become cabaret standards in their own right. It revolves around a young man who follows in his father’s footsteps into the medical profession, but leaves behind the country family practice to move to the Big City as he yields to the ambitions of the childhood sweetheart he married to take up a position attending to the rich and celebrated. He loses a lot more than he gains, as he wakes up to a series of wrenching realisations about wrong roads taken. 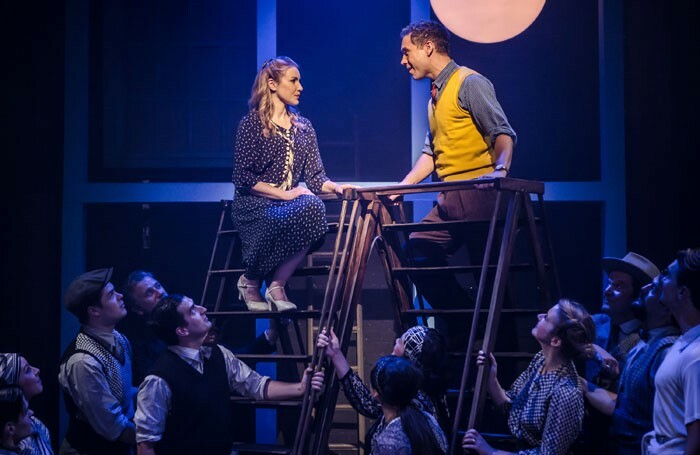 This may be the finest of the stagings Thom Southerland has yet done at Southwark Playhouse: while shows such as Titanic, Grand Hotel, Parade and Mack and Mabel there had great showmanship, here he’s tenderly and gently coaxed out the show’s poignant, resonant drama. But it’s a team effort, and bravos are also due to Lee Proud for his sensational choreography and Dean Austin for sublime musical direction of a generous eight-piece band. There’s also not a misplaced note – musical or dramatic – in the superb cast, but particular stand-outs are Gary Tushaw as the doctor whose life we follow, Julia J Nagle as his devoted mother and Katie Bernstein as his loyal nurse.